Our Water borne Sealers have been designed to be used in conjunction with our Water borne topcoats and for the purpose of product performance enhancement. 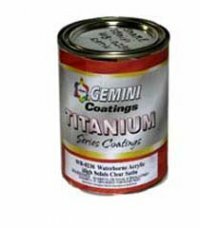 These sealers have been developed using resins which improve the overall durability of the total coating system. They are formulated at a low viscosity and require the addition of no thinners or reducers for most spray applications. Due to their high solids content, these products maximize film build per coat. They exhibit a rapid dry schedule and excellent sandability.